A stunning chaplet that weaves, through restless forms, a myriad and fleshed lie of work, love, and fierce yet tender observations of the working class. I returned to the manuscript again and again, each time finding more reasons to stay. Detail by detail, through the accretion of minutiae and the infinitesimal, the book builds and garners an entire world, replete with throttled sound, image, voice, and unforgettable lives and their living. This is poetry that encompasses, that let's no one turn away." Pastoralism, so we are told, is a played-out sentiment--a stock of images, preconceived and overwrought--clean-handed workers with clean histories who sing clean songs. 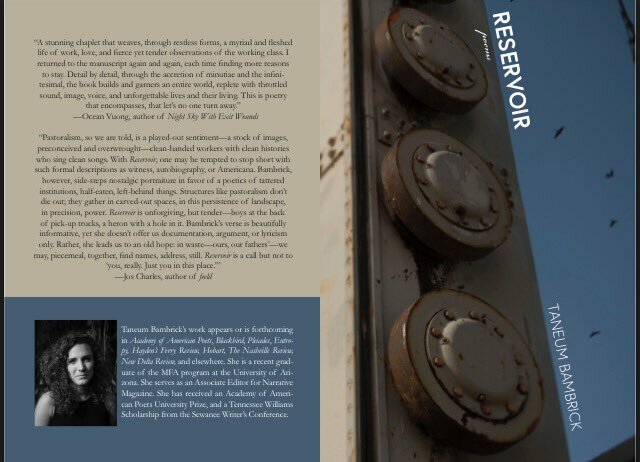 With Reservoir, one may be tempted to stop short with such formal descriptions as witness, autobiography, or Americana. Bambrick, however, side-steps nostalgic portraiture in favor of a poetics of tattered institutions, half-eaten, left-behind things. Structures like pastoralism don't die out; they gather in carved-out spaces, in this persistence of landscape, in precision, power. Reservoir is unforgiving, but tender--boys at the back of pick-up trucks, a heron with a hole in it. Bambrick's verse is beautifully informative, yet she doesn't offer us documentation, argument, or lyricism only. Rather, she leads up to an old hope: in waste--ours, our fathers'--we may, piecemeal, together, find names, address, still. Reservoir is a call but not to "you, really. Just you in this place." Taneum Bambrick's work appears or is forthcoming in Academy of American Poets, Blackbird, Pleiades, Entropy, Hayden's Ferry Review, Hobart, The Nashville Review, New Delta Review, and elsewhere. She is a recent graduate of the MFA program at the University of Arizona. She serves as an Associate Editor for Narrative Magazine. She has received an Academy of American Poets University Prize, and a Tennessee Williams Scholarship from the Sewanee Writer's Conference.